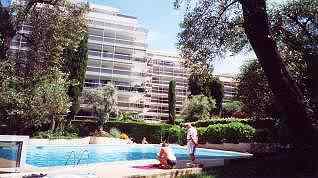 Studio apartment to rent for holiday rentals in Juan Les Pins. 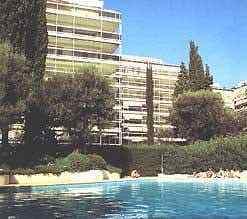 Studio appartment vacation rental 20m from swimming pool is few minutes walk from Juan Beaches, Juan Les Pins town center, Casino and supermarket. Our apartment is available to rent: - If your dates don't match, there are links to other holiday rental apartments and villas in the South of France in Antibes which may be useful lower down this page. 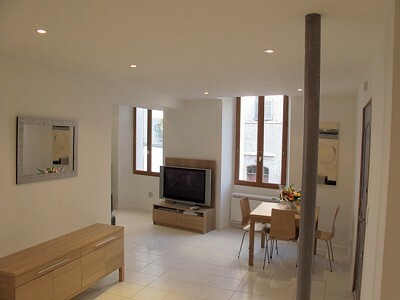 Our Studio apartment is approximately 35m2 plus terrace 8m2 and it faces south so you get beautiful sunshine. It is very convenient for a town based holiday near the sea. It is in gardens of Secure, gated, night patrolled, building, 20 metres from swimming pool, few minutes walk to beaches, town centre shops, station etc. It is 10-15 mins walk from Antibes centre. It's the only apartment that is on a ground floor corner with the advantages of an extra window in the Kitchenette with extra terrace space... It is at botton of corner building shown in photograph above. Recently refurbished and decorated, it has washing machine, electric cooker & oven, refrigerator, etc., microwave oven, TV and video. Two single beds that can be made into double. Possible third bed for child available. Pool use is charged for per day. In July & August it has qualified guard in attendance. Free parking is available on limited basis. June: 556 Euros (approx �6) per week. 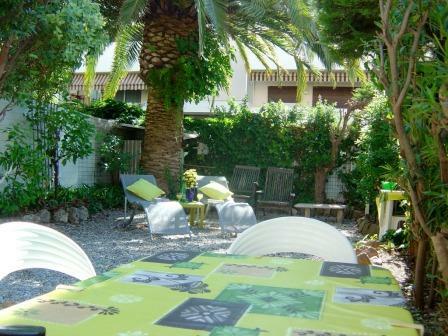 July & August: 672 Euros (approx �6) per week. 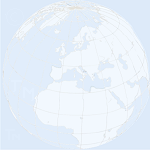 September: 556 Euros (approx �6) per week. We offer 10% reduction for two or more weeks. We ask 50% of total due on booking and the balance at least four weeks in advance of arrival date or in cash on day of arrival. By Road: Autoroute A8/E80 Exit Antibes direction Centre Ville, take 'Boulevard Wilson' up hill direction Juan Les Pins, turn left at traffic lights (next to Lycee Audiberti) onto 'Chemin de Tanit'. By Train: SNCF Station at 'Juan Les Pins' is 650m by foot, turn left exiting station to 'Boulevard Wilson' or take taxi from Station at Antibes. By Plane: Nice International airport 20km. 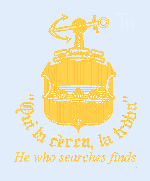 Take taxi or bus for Juan Les Pins. Telephone number for bus hours 04 93 34 37 60 Bus stops near Chemin de Tanit. Boat trips to 頻es de L閞ins, off Cannes,around 8-15 Euro depending on season. Local markets, bus excursions to Marine Land, Aqua Splash, Fairground and Mini Golf, Biot glass factories, Eze, Grasse parfumeries, Vallauris potteries, Valbonne Pewter fabrication and Ventimiglia (Italy) markets. Sailing, Windsurfing, Diving, Sports Fishing, Boat rental, Golf, Paragliding and Ultra light flights, Tennis etc. Casino (5 Mins walk), Night clubs, Piano bars and disco's, late shopping etc. Doctor: Dr Cavaliero Tel. : 04.93.61.52.53. Hospital Antibes Tel. : 04.92.91.77.77. Chemist at Station. : 04.93.61.01.24. Bureau de change is near Station. Nice: 1st floor apartment near the old city and the port of Nice (sleeps 4) The southern exposure allows for a pleasant stay. You will find everything you need at the 揷entre commercial Nice TNL� that is just down the street. The train station is just a 5 minutes walk away from the apartment. 2019: Good availability - please enquire. Villefranche Old town rental appartments with sea views. Two one bedroom apartments beautifully renovated and decorated with original art, great lighting. Each apartment has an office or desk area with wireless broadband if you need to catch-up with some work, do some writing or find out about local events on the Internet. Apt 1 Sur le Toit: 2019 . . . : Good availability.. Apt 2 Artist's Atelier: 2019 . . . : Good availability.. Apt 1 � Sur le Toit. . Apt 2 � Artist抯 Atelier. .
Villefranche sur Mer apartment to rent near Nice Old town apartment recently renovated very beautifully in small town full of character with sea views. 1 bedroom Apt 1 Sur le Toit: 2019 . . . : Good availability.. Apt 2 Artist's Atelier: 2019 . . . : Good availability.. Apt 1 � Sur le Toit. . Apt 2 � Artist抯 Atelier. .
Make sure you travel comfortably - if you're going to the beach or camping - or if you fear an airport delay in June July or August - pack a good airbed / lilo in your luggage! �+p&p. Available here out of season in September October through to March April and May and for Winter trips to hot places!